1 Owner From New With Bmw Dealer Service History (Last Stamp At 17k) - Flowing Lines, Sporting Dna And Cutting-Edge Technology Delivering Yet More Exhilaration - Finished In Glacier Silver Metallic Paint - GPS Satellite Navigation System, Luxurious Full Leather Upholstery, Mp3 iPhone iPod USB & Aux Music Ports, Automatic Smart Key, Front and Rear Radar-Type Parking Sensors, Bluetooth Wireless SmartPhone Connectivity, DAB Digital Radio For A Myriad Of Stations To Suit Your Mood, Cruise Control, Rain Sensing Windscreen Wipers, Ultra Responsive And Effortless 8-Speed Automatic Transmission, Sports Paddle Shift, Automatic Headlights With Dusk Sensor, 18In Alloy Wheels, Day Running Lights, Front Fog Lights, Tinted Glass, Anti Dazzle Rear View Mirror, Engine Start/Stop Fuel Saving Technology, Electric Hill Holder, Cornering Brake Control, Stability Control System, Electronic Brake Distribution, Hydraulic Emergency Brake Assist, Isofix, Flat Tyre Indicator, Dual-Zone Climate Control, Front And Rear Electric Windows, Radio/CD Player With MP3 Compatibility, 5 Star Euro NCAP, Leather Covered Multifunction Steering Wheel, Euro 6 Compliant Emissions, All our vehicles may have previously been used for business purposes. Please check in store for the specific history of this car. 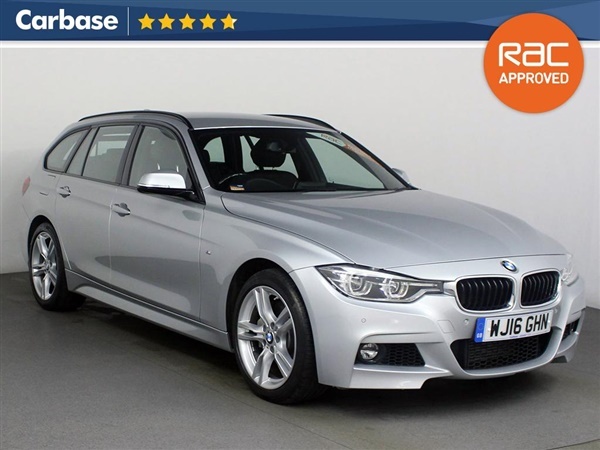 This advert is for a BMW 3 Series, click BMW 3 Series in Bristol to see more cars like this in the local area. Want to search further afield? Click BMW 3 Series in Avon to search for similar cars in the wider Avon area.